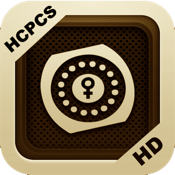 HCPCS Premium puts the complete, latest HCPCS on your iPhone or iPod Touch or iPad. The 2012 HCPCS codes are instantly searchable and also browsable by their traditional categories. Search by code or description, through the whole HCPCS codes or through just a category . Images within the list indicate whether a code is active or not active. Tap to view the HCPCS code and the full text of its standard long description and to add it to your Favorites list for immediate access later. 1.★ Complete 2012 HCPCS codes , with all sub codes and all long descriptions: over 6,000 individual codes, instantly accessible? 2.★ Search within any list of codes, by code number, and by full text of long descriptions? 3.★ Browse HCPCS by category and subcategory; easily limit searches to particular categories? 5★ Keep a Favorites list of HCPCS codes. 6★ Support Airprint to print your favorite codes. 7★ Unlimited number of favorite HCPCS codes can be set . 8★ Auto suggest to make search in HCPCS codes more powerful and easy to use . 9★ Easy to customize through setup to change the way of display , share and printing HCPCS codes.